What it is: A best-selling, waterproof false-lash adhesive. What it does: Hold your false eyelashes securely in place, for a look that is all drama—in a good way. What it is formulated WITHOUT: - Parabens - Sulfates - Synthetic Dyes - Petrochemicals - Phthalates - GMOs - Triclosan Suggested Usage: -Apply a thin line along base of false lash (never apply directly to your eyelids.) -Let adhesive set for 30 seconds or until sticky; during this time, holding the lash by both ends of the base strip, flex it back and forth forming the shape of a horseshoe (this contours the base strip to fit your eyelid easily and comfortably). -Center the lash close to the base of your natural lashes and press ends into place. -To secure the lash firmly, gently press down on the lash strip from one end to the other until adhesive is dry. 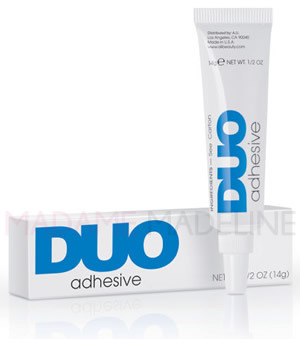 -To insure proper flow of adhesive, remove any hardened adhesive from tip of tube.